Stephen Colbert, James Corden Mourn Taylor Swift and Tom Hiddleston’s Split: Watch! They&apos;ve got the Hiddle-split blues. 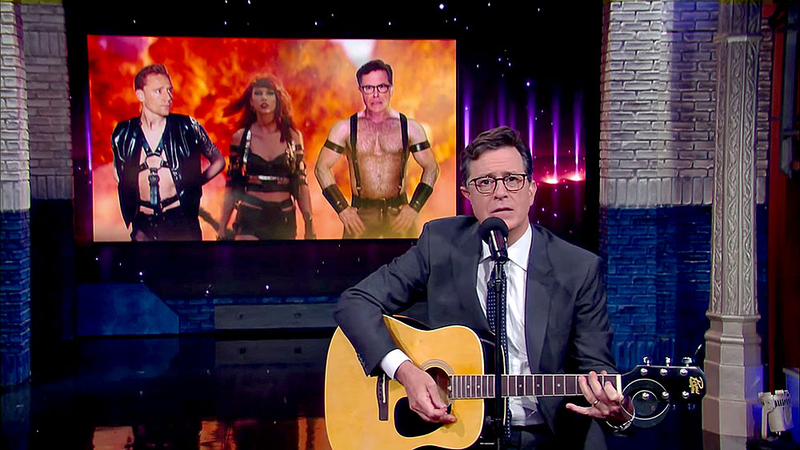 Stephen Colbert and James Corden mourned the tragic breakup of Taylor Swift and Tom Hiddleston during their respective late-night shows on Wednesday, September 7. The day before, Us Weekly exclusively confirmed that Swift, 26, and the British actor, 35, ended their relationship after three months of dating. An insider told Us that the pop star was the one who "put the brakes" on the romance. Needless to say, Colbert, 52, didn&apos;t take the news well. "Taylor has sent Hiddleston packing back to Asgard or Hogwarts or wherever he&apos;s from," he said during The Late Show, referring to Hiddleston&apos;s Thor character, Loki. "I&apos;m especially sad about this news because their love was in the press so much, I thought I was a part of it. In a way, it feels like they broke up with me. In fact, I&apos;m so upset that I did what Taylor does when she goes through a breakup — I wrote a song about it." Colbert then pulled out his stringless guitar and belted out an original sappy tune. He most notably recalled photos that The Sun published of Swift and Hiddleston kissing on rocks near her Watch Hill, Rhode Island, mansion. "Taylor, Tom and me, we were a happy couple of three. But now they said goodbye and I just want to cry. How could you do this to me?" he sang. "Think of all our memories. Like kissing on that rock. Or climbing on that rock. Or walking on that rock. Man, we spent a lot of time on rocks." Corden got just as choked up about the breakup. "We&apos;re going to start with a news story that has gripped the nation — dare I say it, the world. It&apos;s tough," the Late Late Show host, 38, said during his monologue. "After a whirlwind three months, Taylor Swift and Tom Hiddleston are ending their relationship. I&apos;m going to give everyone a moment." When one audience member laughed, Corden quipped: "Don&apos;t you dare!" He added: "As soon as Taylor&apos;s band heard about the breakup they were like, &apos;Yeah, yeah, we know. We are heading to the studio now.&apos;"
Swift and Hiddleston first went public with their romance in June. During their time together, they met each other&apos;s parents, traveled around the world together and celebrated the 4th of July — with lots of celeb pals — back up in Rhode Island. Hiddleston memorably wore an "I ♥ T.S." T-shirt while swimming at the bash. Corden joked about the attire, and shared a Photoshopped pic of Hiddleston now wearing a top that read "T.S. Is BS." Watch Colbert and Corden talk about HiddleSwift in the video above!